Britain’s divide: Diversity key to turnout rises? 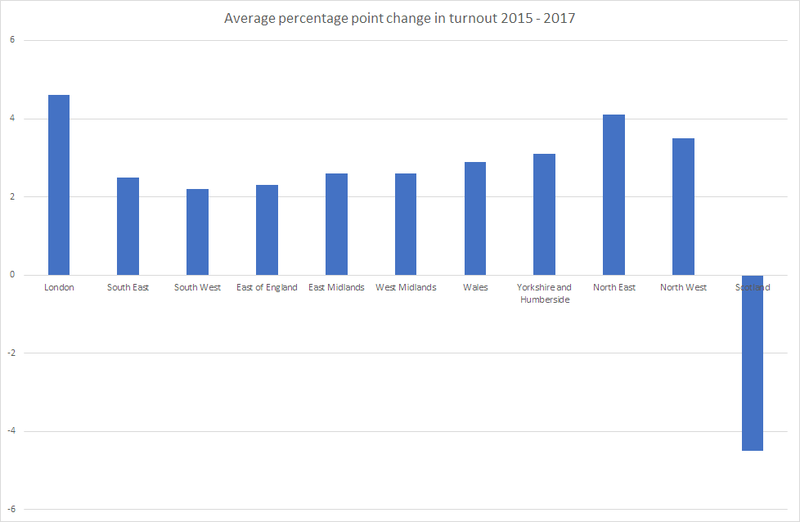 The increase in turnout was among the many things that confounded commentators about the 2017 General Election. Many had assumed that electoral fatigue would set in; with the Conservatives forecast a large majority at the start of the campaign and the Labour party leader historically unpopular there seemed little to enthuse and motivate voters. Despite these expectations turnout rose by an average of 3 percentage points; though this showed substantial regional variation (with turnout falling in Scotland). It seems London was more enthused than most of the rest of England and Wales; though the North East also saw an average rise of more than 4 percentage points (albeit starting from a lower base). In this piece, I consider potential explanations for this unexpected rise in turnout and suggest that the story (like so many to come in explaining the outcome) is less simplistic than it seems. To avoid confounding factors from Scotland, I focus the attention here on the constituencies in England and Wales. As in 2015, it seems completely different dynamics were at work in Scotland which demand and deserve their own set of explanations. 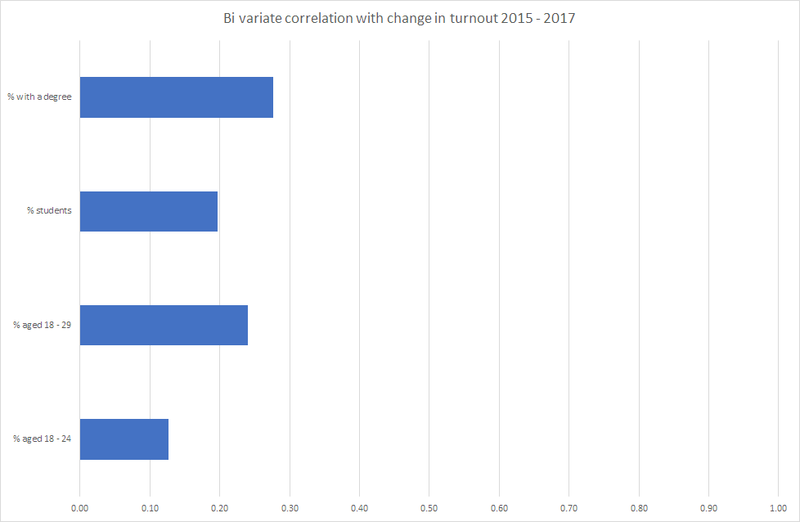 Taking change in turnout (in raw percentage point terms) as the key measure here we can look at some of the social and political influences that correlate with turnout change. A brief disclaimer about the data and methods used here. These are all aggregate level correlations. We cannot and must not infer from these anything about the behaviour of individuals. In writing this I think of these measures as ‘mood music’ for places; they give us an indication of the sorts of places where more people turned out to vote they categorically do not tell us about the type of people who voted. For this reason there is also limited multi-variate analysis here; issues of multicollinearity are present in many measures but also it is much more difficult to effectively interpret ‘mood music’ when looking at multiple characterisations of area simultaneously. The revenge of the young? The most prominent ‘hot take’ for rise in turnout is that the young were particularly motivated to vote (this was a key point of debate in the run up to the election and in explaining differences between the findings of different polling organisations). Using data from the 2011 Census we can measure this possibility in different ways. Here I have looked at four potential measures of the proportion of ‘young’ people in constituencies; the proportion aged 18–24; proportion aged 18–29; proportion with a degree level qualification and the proportion of students. Simple bi-variate correlations suggest that of these measures it is the proportion of those with a degree that is most strongly related to the turnout rise, it is substantially more strongly correlated than the proportion of 18–24 year olds (though only marginally stronger than the proportion of age 18–29 year olds). A simple linear regression model with % aged 18–29 and % degree as explanatory variables confirms this, the effect of the proportion with a degree is a little stronger than the proportion of people age under 30 but both remain significant influences on turnout change. Combined they account for about 10% of the variance in turnout change. This suggests that turnout change may not have been driven by the very youngest voters, there is only a weak relationship between turnout change and the proportion of 18–24’s. Rather it appears more strongly related to areas with highly educated populations and higher proportions of those under 30. This is likely to mean areas with higher proportions of recent graduates; perhaps feeling the pinch of tuition fees most acutely as they enter the housing and labour markets. Factors other than the ‘young’ vote have received virtually no attention so far. Here I consider the class, religious and ethnic make-up of constituencies and their relationship with change in turnout. First we should note that in this section all the correlations are negative, indicating that where the proportion of that group rises turnout change falls. The effect of the size of the working class (defined using ns-sec groups ‘Routine’ and ‘Semi-routine’ occupations), in a constituency is quite small (though similar in size to the effect of the proportion of 18–24 year olds) From a class perspective the proportion in ‘Intermediate occupations’ is much stronger and of a similar magnitude to the proportion of under 30’s and those with a degree. However, the proportion of white British in a constituency is much more strongly correlated with change in turnout than any of the other measures. This is a negative relationship, suggesting the more ethnically diverse areas had a higher increase in turnout than less diverse areas. A simple regression model further suggests that the effect of the diversity of a constituency is not only stronger than the effect of the age or education profile but when included alongside it (and the proportion in intermediate occupations) the effect of the proportion of under 30’s and proportion with a degree become non-significant. In other words, what appear to be effects of an increase in motivation in places where there are lots of young people is in fact an increase in motivation in diverse areas. If we look at the correlation between these two factors we can begin to see how this might be understood. The correlation between the % White British in a constituency and the % Under 30 is -0.55, in other words diverse areas tend to have younger populations. This suggests the narrative about turnout change in 2017 is more complex than just getting out the ‘young’ vote. It suggests turnout rose most where the population was ethnically diverse. Finally, I turn to the political situation of the constituency. Here I look at the share of the vote for each party, the marginality of the constituency in 2015 and turnout in 2015. 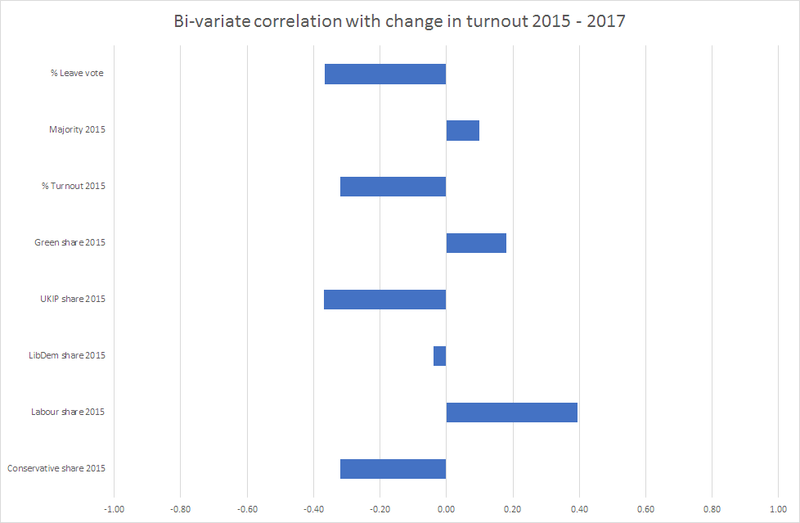 The political factors show some of the strongest correlations with turnout change, perhaps unsurprisingly as these can be thought of as the already worked out consequences of the social factors described above. The ‘mood music’ of constituencies is slow to change, and the previous election was only 2 years ago. Of these, strongest is the correlation with the Labour share of the vote in 2015. Turnout rose most in areas where the Labour vote was strong in 2015. Conversely, turnout rose least in areas where the UKIP and Conservative votes were strongest in 2015. Turnout also rose less in areas where turnout was already higher in 2015. Taken together these figures are suggestive of an increase in motivation for voters in Labour areas, and given the pattern with turnout it is possible this is a motivation for non-voters in Labour areas (though the caveats of inference from aggregate data must be heeded here). It is also perhaps indicative of the party ‘stacking up’ votes in places it was already doing well but that is an analysis for another day. Using Chris Hanretty’s estimates of % leave vote we find a strong correlation with turnout change. 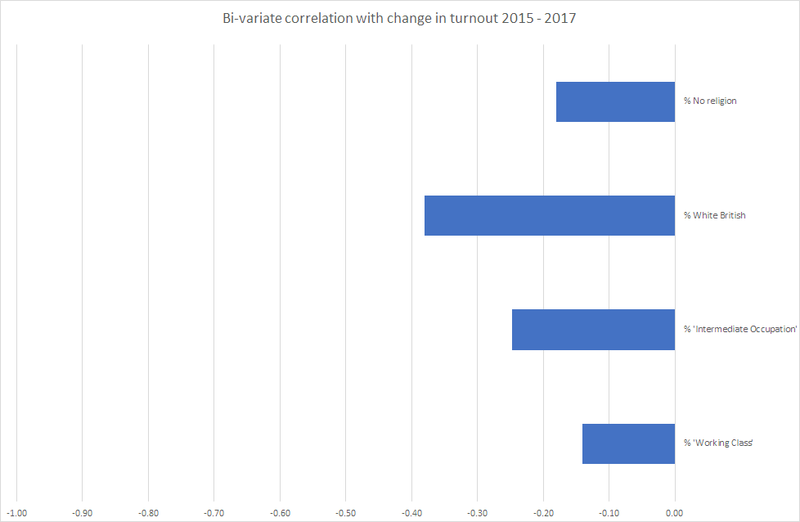 Where the leave vote was higher turnout change was lower; this is one of the strongest observed bi-variate correlations. As suggested above this already reflects many of the characteristics of the areas (indeed these are used to generate the estimates) and so cant be treated as independent measures. Nonetheless, it is confirmation that diversity and education are more strongly related to turnout change than the % of young people in the area. This analysis is intended to be exploratory; to effectively explain turnout changes data on individuals (micro data) are needed to consider how age, education and diversity interact alongside political and social values. This exploratory analysis suggests that the key divide identified by many after Brexit between the ‘winners and losers’ of globalisation; the ‘cosmopolitan areas vs ‘backwaters’’; the ‘Somewhere’s and the Anywhere’s’ is not going away and will continue to have electoral ramifications as well as wider consequences for political engagement. Understanding this divide, its character, consequences and how to bridge it is a challenge for both the political elites and political sociology.